Between us, we have 60 years of general practice experience in New Westminster with admitting privileges at Royal Columbian and St. Mary’s Hospitals. The impending closure of St. Mary’s will leave an irreplaceable void. As full time family physicians, we are finding it increasingly difficult to directly admit our ill patients to hospital. St. Mary’s represents the last bastion. It has also served as a safety valve for the Royal Columbian Hospital Emergency Department when it has been bursting at the seams. The timely transfer of elderly patients with hip fractures enables surgical repair that evening or the next day. The alternative is languishing in the RCH Emergency Department Overflow ward with analgesia and intravenous fluids for up to four to five days and increasing risk of dehydration, pneumonia and deep venous thrombosis - waiting for an operating room slot. The laws of natural selection often come out the victor. The loss of St. Mary’s compassionate palliative care unit is the hardest blow to accept. After 30 years of practice, many of our patients are in their 70s, 80s and 90s, often in the terminal phase of their life. No longer can a full time general practitioner provide cradle to grave care. Unable to cope at home, terminally ill patients are transferred from RCH Emergency or directly admitted to Burnaby General Hospital Palliative Care or hospice units. This has already been the fate of two of my patients. We are no longer able to support our patients or liaise with their families at this time in their lives. The compassion of St. Mary’s nursing staff is unparalleled. Recently I had a frail elderly man admitted for medical care. Several days after admission I was notified by a ward nurse late one evening that his visiting wife was progressively deteriorating. She was put up in an empty bed and could be admitted on compassionate grounds if I could make arrangements with bed booking. I did. The next morning on rounds I was surprised to find the husband and wife sharing a double room. Within a week they were transferred to an intermediate care facility with identical living arrangements - only at St. Mary’s Hospital could this have occurred. Summer 2005 - The End! This centrally located institution provides a myriad of services to our senior outpatients. I have lost track of the number of visually impaired patients that have benefited from cataract extraction and lens implant surgery. Their home independence and driving privileges are maintained. The diagnostic mammography and breast investigation unit provide an invaluable service in the investigation of breast abnormalities at one site. The lower bowel investigation unit provides a similar role of investigation and treatment of lower gastrointestinal symptoms. The bone densitometry unit has become increasingly important with the expanding awareness of osteoporosis in our senior male and female patients. It is an important tool in our diagnosis and treatment follow-up of this crippling condition. The diabetic day program is an important aid for the education of our newly diagnosed diabetics with annual follow-up to ensure compliance. Consultation with endocrinologists and retinologists for complicated patients is available on site with specialized technology to protect vision. The pulmonary function lab and respiratory rehabilitation ward is invaluable in monitoring and treating our patients with severe lung diseases such as chronic bronchitis, emphysema and adult onset asthma. The patients usually recover and return to their homes. The geriatric evaluation inpatient and outpatient unit will be sorely missed. This unit provides an invaluable resource in assessing and stabilizing our frail elderly patients with multisystem disease. The intervention of this unit on many occasions has maintained my patients at home for months to years when facility placement appeared inevitable. The Drive Safe program is a valuable aid in the assessment of driver’s skill and accident risk potential with chronic or multisystem disease. The physio and occupational therapy departments serve an important role in the recovery of patients suffering from orthopedic injuries, motor vehicle and cerebral vascular accidents. It is the only facility that would provide service at a reduced fee or free of charge for patients suffering financial misfortune. The closure of this hospital removes the heart and soul of our medical community. It is old but not antiquated. The callus disregard and treatment of the dedicated physicians, nurses and support staff leaves a bitter taste in one’s mouth. 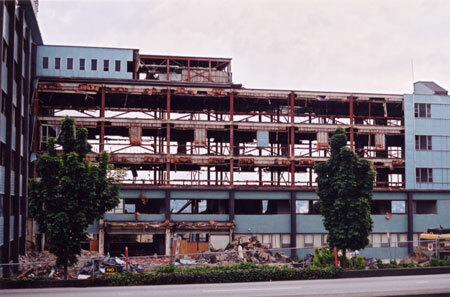 This is indeed a sad day for the physicians and residents of New Westminster! John & Ana Ruth Albrecht, M.Ds.